At Musikmesse 2011, VOX presents the custom Virage II Butterfly Series, featuring special finishes and special ornate inlays. For the 2011 Musikmesse, VOX has created the Special Edition Virage II Butterfly Series; six custom-created Virage II guitars with special finishes and Paua shell butterfly inlays. These instruments (VG2SC-M11-01 / VG2DC-M11-01) feature Mahogany tops and backs stained green and red, respectively; silver grain filler is then applied. The result is a "hair-line" finish designed to be similar to the fur of a fox. The VG2SC-M11-02 and VG2DC-M11-02 feature thick flamed Maple tops with Mahogany backs. Finished in Black Cherry and Transparent Black respectively, these models offer a rounded edge, with no binding to distract from the wood finish. These guitars offer the feel of an oil finish applied to their Mahogany tops, back and sides. The VG2SC-M11-03 and VG2DC-M11-03 are detailed with Rosewood grained binding. No pricing info as of this writing. 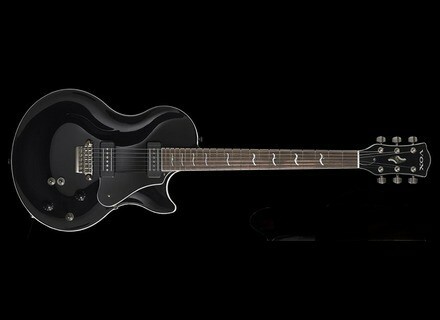 [Musikmesse] New Vox Series 55 Models Vox has announced eight new finishes for its Series 55 guitars. The SDC55 will be available in Black Burst, Flame Maple and Trans Amber, while the SSC55-TR-FM in Trans Red, Flame Maple and Trans Amber. [Musikmesse] VOX Valvetronix Pro VTX150 Neodymium VOX say they have created a new breed of Valvetronix amp: The Valvetronix Pro. [Musikmesse] VOX USA Custom Guitars Starting in April of 2011, VOX Guitars' G-Rok R&D facility in Novato, California, USA, will begin handcrafted electric guitars on a limited production basis.